photos as jokes, but what they do not understand is that this is a type of discrimination against individual with Down syndrome. This first photo or meme that has been circulated around Facebook portrays a young man orchestrating a symphony, but most people skip right over the picture and go right to the funny caption. This caption has nothing to do with the young man. Without the caption this young man would look like an intellectual human at work, but with the caption this young man is seen as lacking intellectuality. The people who create these photos and circulate them around social media as jokes are the cause of discrimination against people with Down syndrome on social media websites. This photo has been seen on multiple occasions on Facebook and Twitter with numerous captions. Another caption for this photo is “and a one, and a four, and a ching chong potato” (Boyle). 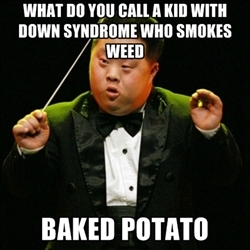 Individuals with Down syndrome have been associated with the phrase “I can count to potato” (Boyle). Until recently it was not certain where this phrase was produced. The phrase was captioned in the movie The Ringer where Johnny Knoxville impersonates an individual with Down syndrome (Blitt 1). This caption has been used in hundreds of memes of individuals with Down syndrome. This caption is suppose to stand for a loss in intellectual abilities. 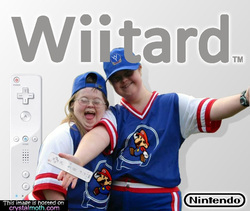 People who are misinformed about Down syndrome believe these people have a loss of intellectual ability. Because people with Downs syndrome look different and learn differently people feel that they have the right to discriminate against these individuals. When comparing people with Down Syndrome to those who may have dyslexia it would appear that the learning curve could be comparable. You do not find many discriminatory comments about dyslexia on the internet, yet people with Down syndrome appear to be targeted. what they label them as (qtd. in the_bmw). Another note in this image is the abbreviation of DS which could be mistaken for the abbreviation of Down syndrome, but stands for dual screen. Stated in the earlier video on this website We’re More Alike than Different and the video of Adam’s Story individuals with Down syndrome do not like being referred to as retards. The slang retard makes these individuals feel angry and sad. People with Down syndrome are very aware that there is something different about them. People with other types of disabilities often do not acknowledge that they are not like everyone else. It is not something that is part of their thought process.